In Namibia, as in many parts of Africa, young lesbians navigate intersecting racial, cultural, gendered, sexual, religious and professional identities. Being caught up in this nexus, particularly when it reflects several layers of oppression can be a disempowering experience. 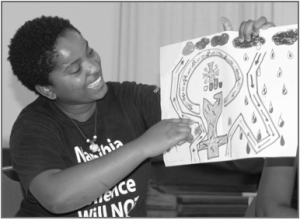 Organisations such as Women’s Leadership Centre (WLC) in Namibia have worked tirelessly in the last 10 years to help young lesbians build resilience to deep-seated patriarchal ideas and develop the inner wealth of self-awareness and confidence. These efforts help to build a strong feminist, lesbian voice in a continent struggling with a rise in fundamentalism that threatens to erode hard-won human rights gains. towns. The participation of young lesbians builds next generation activism for human rights related to sexual orientation and gender identities. Although WLC works with lesbian women from various small towns and villages across Namibia, it also reaches young rural women living under customary law as well as young San women in indigenous communities, uniting them in their understanding of how patriarchal ideas shape homophobia as much as gender stereotypes. Creative interventions such as writing, dance and photography are used. Through training in community photography young lesbians express themselves, their communities and their sexuality in positive and empowering ways. One result of these efforts has been the travelling photo exhibition “Creating ourselves in our own image”. Some of these images (along with related texts) have been translated into a photo book that has been widely distributed, including to policy makers. WLC has long been a player in the feminist space in Namibia. Its founders have been outspoken activists for lesbian and women’s rights for over 20 years. 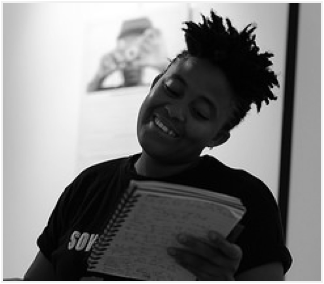 It is committed to long term and strategic change by collaborating with like-minded organisations such as the Coalition for African Lesbians and the Gay and Lesbian Memory in Action. of awareness-raising into its programmes in concrete ways. The booklet “Loving and supporting our lesbian daughter: A guide for parents, families and friends of young lesbians in Namibia” has been translated into Afrikaans and Oshiwambo, the two most widely spoken and read languages in Namibia. The organisation’s 10th anniversary celebration in December 2014 was an entertaining and high profile event attended by approximately 100 people including artists, musicians, donors and members of civil society organisations. The Other Foundation was drawn to the holistic nature of WLC’s work. Deeply personal transformation through creative interventions is married with strong feminist critiques. 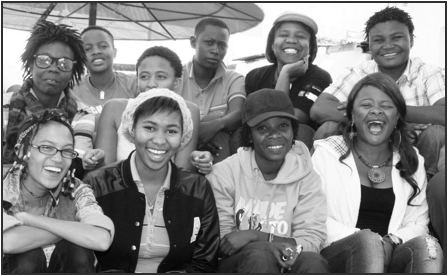 With a grant of ZAR150,000 from the Other Foundation in 2014, WLC continues it important work of empowering lesbian women to dismantle patriarchy, stigma and discrimination.